Here is the text (along with some slides and short videos) for the presentation I gave yesterday as the 9th Annual Sue MacRae Lecturer, which I mentioned here. It was my most satisfying presentation to date – I worked hard on the message I wanted to deliver and the audience was attentive and engaged, making for a rich discussion. It was such a rewarding experience I was sad when it was over! Note: the videos have no sound except for the last one. This is my son Owen. He was my first child, born in 1998. By the time of his birth he had already had a complicated journey – he’d had surgery inutero several times and was born several weeks early. The first 3 months of his life were in neonatal intensive care, on a ventilator. When we left that phase behind us and finally got home, we thought we were in the clear. However, Owen did not develop typically. Physically, he missed milestone after milestone, never gaining functional control of his trunk, head or extremities. He required full assistance for all aspects of daily living – he was non-ambulatory, incontinent, and deaf; he had virtually no functional use of his hands; he received a feeding tube around 4 years of age and an implanted device to manage his spasticity a few years later. 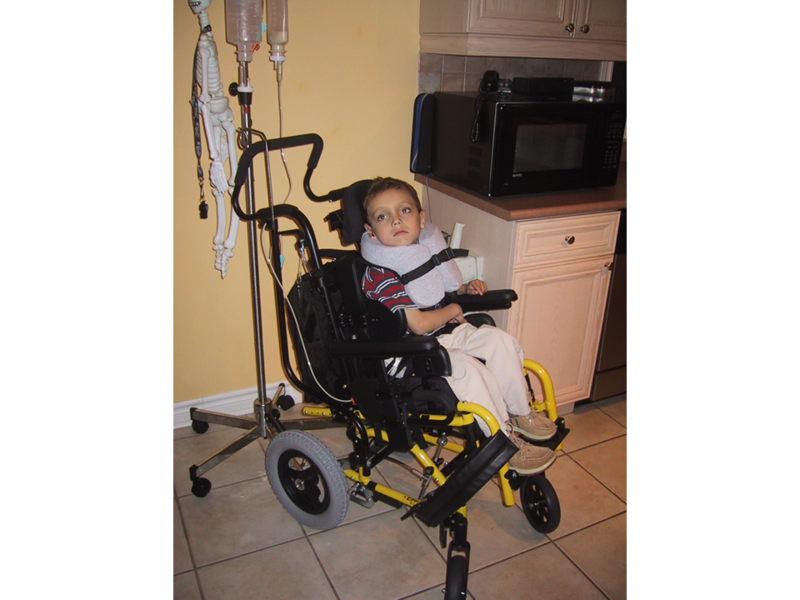 He had fully-supportive assistive equipment, including a stander, neck-and-head support and a custom wheelchair. His health was surprisingly robust with the exception of frequent aspiration pneumonias. 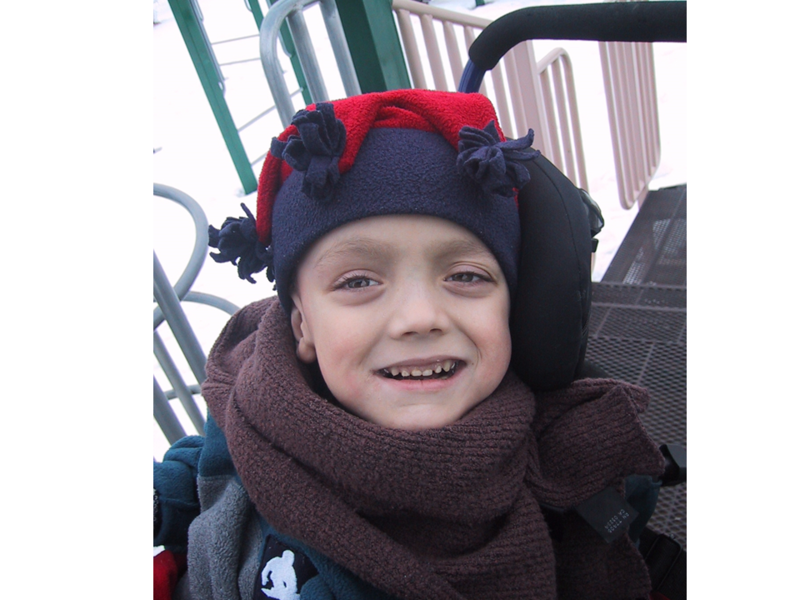 Socially and cognitively, Owen was a content and curious boy – watchful, responsive, sensitive. He generally understood his surroundings – he knew what was good, what was absurd, what was scary, what was funny, what was sad. He was most interested in people and animals – and was most engaged when approached with warmth and intention to communicate or connect. 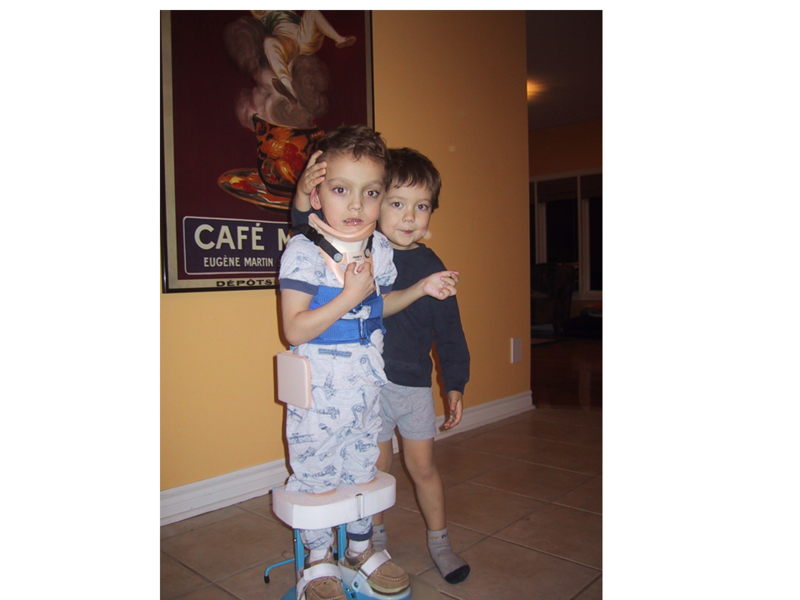 Owen’s interest in his world, combined with his physical limitations and his deafness, provided a compelling challenge for me and Owen’s various therapists and physicians. No stone was left unturned in pursuit of finding ways for Owen to develop physical function and communication. Owen’s brother, Angus, is two years younger. 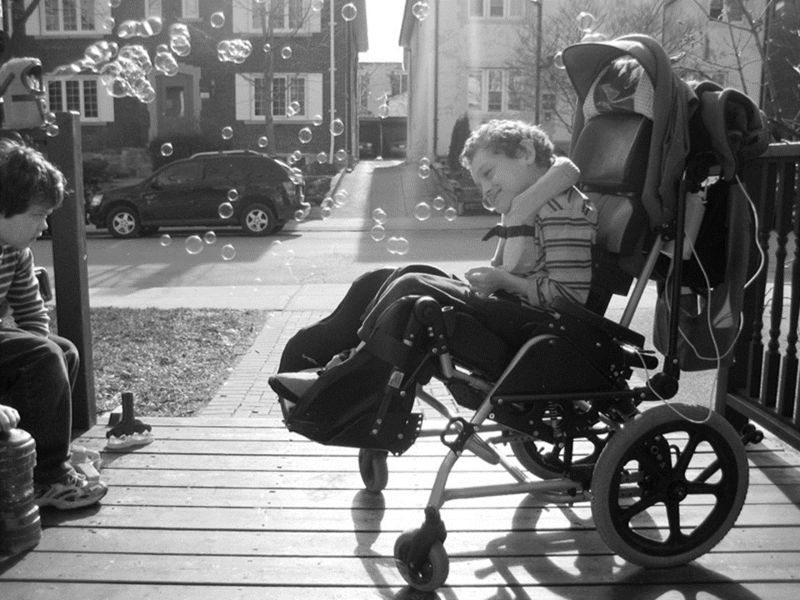 Angus was Owen’s chief companion and advocate, proudly holding his hand or pushing his wheelchair, shrugging off stares from other kids and criticizing adults for talking to Owen “like a baby”. My partner Michael was an active father and deeply accepting of Owen. He had a well-paying job outside the home while I worked in the home – I was in charge of the household, family matters, and Owen’s routines and therapies. Michael and I separated in 2007, but quickly established a friendly and consistent routine of sharing care of the boys, with Owen’s caregivers working with him wherever he happened to be. Owen died in 2010, at the age of 12. His death took us all by surprise, as he’d been in good general health for the previous year or two and did not appear frail. He died sometime in the night while the household slept. His official cause of death was SUDEP, which in part stands for ‘sudden unexplained death’. We were not disappointed by this lack of ‘real’ cause of death. Although Owen’s official diagnosis was ‘cerebral palsy’, there was no evidence of brain injury, congenital anomaly or other clues that might lead us to an underlying cause for his impairments. We were used to not knowing. Not long after Owen’s birth –while he was still in intensive care – I realized that even though they were taking care of his fluids and his lungs and his infections, I was expected to take the lead with his development. I had entered a world where I couldn’t just be his mother, witnessing and relishing the person he would become. . . I came to understand that there are windows of time where developmental opportunities must be seized. To work on head control, chewing, sitting, vocalizing. Because of my role as his mother, I was apparently his best chance at improving, learning, and growing. I rose to the occasion – as was expected. This was a role I embraced whole-heartedly. I threw myself fully into the work of therapist-parent. No therapy too complex, no intervention too small, no equipment too expensive. Every moment was a learning or therapy opportunity. Our household was turned upside down with adapted toys, picture symbols, Velcro boards, assembled play kits, switches and augmentative communication devices – homemade tassles taped to balloons. . . I learned ASL and hired deaf support workers to facilitate our language development. As readers of my book or blog will know, I developed a strong dissatisfaction with Owen’s treatment trajectory. It happened slowly, over time. I became disillusioned with the promise of increasingly elusive ‘improvements’. In our case, hard work resulted in virtually nothing – just more hard work. Hope had become a ball and chain, tying us to a rigid path where one therapeutic task led only to another and another and another, with no end in sight. We measured progress in increasingly microscopic amounts. We stopped evaluating progress on functional improvements and instead congratulated ourselves on how long Owen could tolerate sessions without falling asleep or crying. It became therapy for its own sake, validated by our efforts, but not by results. I also felt suffocated by what I call cheerful pretending – where Owen’s assistants, teachers and therapists would persistently and embarrassingly attribute characteristics to Owen that were so enthusiastically cutesy and charming and frankly made up, it would be considered bad form to break the spell. Owen won leadership awards, was assigned ‘best friends’, was praised for his wisdom and patience. To be fair, I yearned for this when he was little. Who doesn’t want to hear this about their child? But as he grew, and I became more skeptical, I couldn’t play along anymore. These were no longer fun aspirations, but exasperating lies. The cost of trying to fix Owen became more than I was willing to pay. When he was around 8 or 9, I withdrew him from most of his developmental programs, including school. These decisions were met with very little resistance by our health care providers – mostly, I was applauded for my fortitude and clear-headedness. One therapist later told me she was surprised I held on for so long. I described just now a picture of growing frustration but this wasn’t all that visible until well into his middle childhood. I think on the surface I was just another special needs mom – a term most of us hate but keep using – doing my best to get along, try everything possible, investing everything in pursuit of my son’s potential. I questioned some things, accepted others. I made good use of the system and the opportunities it gave me to make decisions. As you might imagine, we encountered many kinds of health care institutions and services – medical, developmental, educational, communications-related, OT and PT, community services – and every one of them espouses some version of person, patient or family-centered care. Our various institutions gave me room to say when, how much, and what for – and when I’d had enough. Some might say I am a PFCC success story. . . and there was probably a time I would have agreed. There’s a growing body of research about PFCC – the tone is optimistic and supportive, if somewhat cautious. Researchers point to the potential to improve patient outcomes, better utilize resources, decrease costs and improve satisfaction – but lack of consistency and uneven quality of implementation can impede success. Opinions differ as to how to best overcome these barriers but generally, people agree that PFCC is a good and important initiative. In this talk, you’ll see that I think it’s worth considering the extent to which this is true. Up to now, I’ve given a rather broad birdseye view of my 12 year journey with Owen. Now, I’d like to share 3 specific experiences with you, each of which are hospital encounters. Consider these principles as I share these stories. Or just think about the words ‘family-centred care’, and see if it fits. Owen ‘failed’ his auditory evoked potentials while still in the NICU. His profound hearing loss was confirmed when he was around 2 years old. I remember how the audiologist sat us down to deliver the news. “I’m sorry”, she said, eyes downcast. She let us know that someone would be in touch soon, to discuss next steps. It was a strange experience – after all we’d been through with Owen, her apology seemed unnecessarily grim – frankly we were just pleased that Owen was alive at all –to this point, we had not thought of this potential diagnosis as a ‘problem’. The hospital clinic automatically placed children with profound hearing loss on the cochlear implant waiting list. They were keen to get new children assessed and ‘processed’ quickly. When we attended the information session, we found out why: the clinic had received funding to do a certain number of implants in a certain amount of time. The allotted time was coming to an end, and the surgeon wanted to move through the waiting list before the deadline. His presentation during the information session was focused on this funding. Later, I asked our assigned social worker why Owen was placed on the cochlear implant list when it had never been discussed. She seemed surprised at the question, and reminded us that the cochlear implant is what the hospital provides as treatment for profound hearing loss. According to the hospital, the cochlear implant was simply ‘the next step’. By the time Owen was four years old, he was exceptionally thin. Feeding continued to be extremely difficult: he aspirated liquids and solids alike, could not chew effectively, and had razor-sharp teeth (due to acid wear from reflux) that cut through his lips and inner cheeks. If he was sick, it was almost impossible to get him to ingest antibiotics, pain relievers or any other medications; because of his reflux, he often vomited whatever food we could get into him. Yet, I was determined to persist in feeding him by mouth. 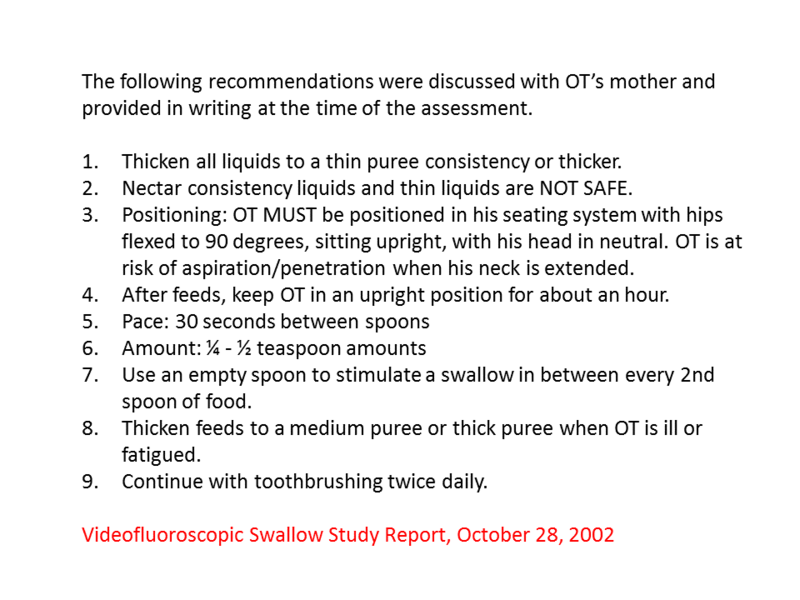 After every swallow study, I was given careful instructions for thickening his liquids, pureeing his solids, timing his swallows, positioning his head and neck, and encouraging chewing. I was praised for ‘sticking with it’. On one (final) occasion, I was given instructions that, if followed, required that I feed Owen for over 6 hours every day! I confided in a friend (who was also a nurse) – she encouraged me to ask about getting a feeding tube. I was resistant at first, insisting that because it was never suggested, he didn’t need it. Eventually I gave in. After an assessment (at my request), we arranged for the procedure to be done. The staff congratulated me for my persistence until then, and reassured me that I wasn’t a failure. With the g-tube, Owen gained weight, his sleep improved and his aspiration pneumonias became much less frequent. 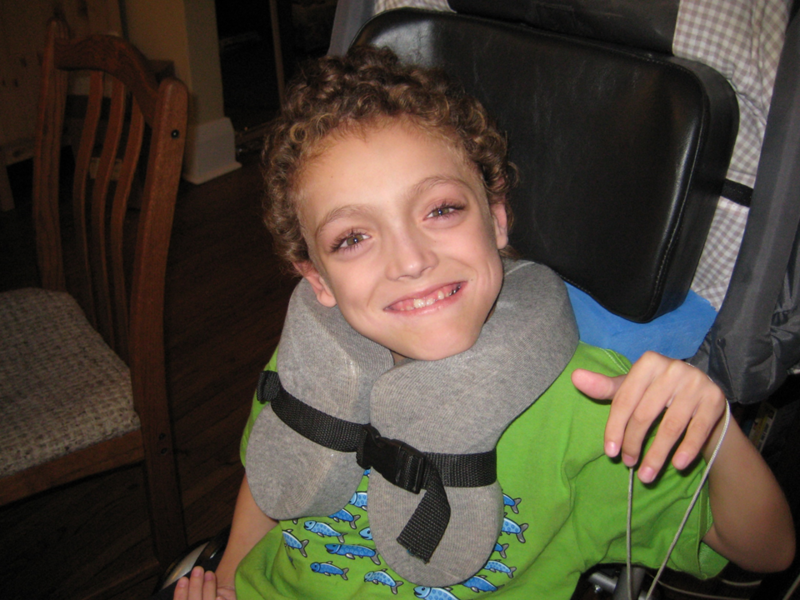 Owen’s dystonia and spasticity were compounded problems – one made the other worse. He had already had an intrathecal baclofen pump, which had malfunctioned and had been removed. His spasticity, then, was untreated and his dystonia made his discomfort worse. His unpredictable movements also made carrying and caring for him difficult. His neurologist suggested we learn more about deep brain stimulation (DBS). We were referred to a neurosurgical specialist. When we arrived, the specialist checked Owen over. She weighed him, moved his limbs, inquired about his movements, asked about his general health and medical history. When she was finished, she made her announcement: ‘Yes, he would be a good candidate’. She went on to tell us about the supporting data, research and statistics. Then she stopped and simply looked at us, waiting for a response. I realized at some point in our conversation that we weren’t quite meeting on the same level. I thought I was there to find out if this surgery was the best solution for Owen, and the specialist was doing an assessment. Her answer was ‘yes’ – but we were asking different questions. I was asking if we should, and she was answering if we can. A subtle but important difference. Despite how nicely we were always treated all along the way, I would never describe the care we received as family-centred. I would say instead that we received mostly good medical care as supported by ‘clinical best practices’, from some nice and supportive people whose world view was entirely institution-centric. In the story about hearing loss diagnosis – we received strong cues as to how we were supposed to feel, we were signed up for services we never asked for, and I thought we were tricked into watching a marketing presentation for a treatment we didn’t want. In the story about the g-tube – I was assumed to be in charge of what was happening, and no one bothered to check if what they were recommending was remotely feasible. I was conveniently left to my own devices because I seemed so competent. In the story about deep brain stimulation – we spent the entire appointment talking past each other, not because of language or misunderstandings, but because, in my view, the intentions of the surgeon were not explicit, and no effort was made to find out what we had come for. Although health care has widened its gaze from the disease itself to the whole organism, to the patient as a person, even to the family – its chief operational goals are still as they ever were – to deliver good medical care to as many people and in the most efficient way possible. I have dozens of these stories I could tell. But interestingly, I never thought of them as ‘stories’ until after the fact. While I have misgivings now about what was happening at the time – back then, I was just so appreciative. My interpersonal exchanges with health care providers were positive, respectful, and even enjoyable. I had no doubt – and I still believe – that they cared about my son’s health and well-being. So even as my misgivings grew, I never wondered if our providers were on our side or not. This is certainly not an experience shared by everyone. My ability to navigate all of this and enjoy good relationships was due in no small part to the fact that I am well-educated, middle-class, fluent in English, I grew up in Canada –I am half-Chinese but more or less pass as white. What if this had not been the case? What if I was none of these things? Or what if I had only some of these privileges? What if I wasn’t more or less white, or had a visible disability? I’ve had opportunity recently to consider this. A couple of years ago I attended a book launch for my friend, Donna Thomson. Her book, “The Four Walls of My Freedom”, (which is an excellent book, by the way!) describes life with her severely disabled son (now a young adult) and frames her family’s experiences through lenses of social justice and equity. She spoke eloquently and passionately about discovering her voice, and finding freedoms, as her son’s caregiver. When Donna finished, a woman rose to address Donna and the audience. She explained she was a lawyer and self-identified as middle-class. Like Donna, she had a son with severe disabilities. But unlike Donna, she was black – her experiences in health care were markedly different. She said something like this: “It’s all very nice to want to pursue your own interests and be fulfilled, but as a single black woman with a disabled child I get treated very differently. When I go to the emergency room with my child, no matter how bad things are, no matter what time of day or night, I stop to put on a business suit to raise the chances I won’t be judged as unfit.” I don’t know the details behind this story but the applause from the audience signaled this not uncommon. I also didn’t ask this woman what she thinks of PFCC, and I don’t think I need to. An acquaintance of mine is a man with a spinal cord injury and has been in a wheelchair since his youth. Bill is an outspoken disability activist and academic who writes about his experiences of disability discrimination and bias in academia, in health care and in the world at large. For me, his most poignant stories, which occur far too frequently, are when well-meaning people fumble spectacularly. 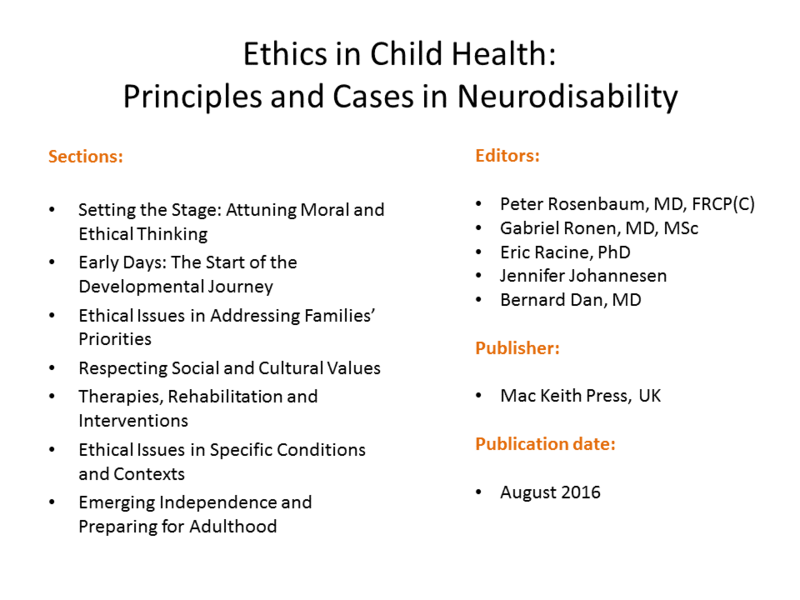 I am co-editor of a book that is coming out at the end of this summer, called “Ethics in Child Health”, which is a compilation of essays from clinicians about ethics in child neurodisability. The initial call was for clinicians to submit real, clinical cases where they experienced and addressed some kind of ethical issue or dilemma. After reading all of them I wouldn’t describe them that way – I would say instead that these were cases where clinicians felt professionally challenged and sought an ethical framework to help them reach a decision or plan of action. This subtle distinction is important because it shows how common it is for ethics to become instrumentalized, and in some cases how ethics becomes instrumentalized under the guise of PFCC. This is how some of the cases went: things are going fine until a dilemma or confrontation occurs. The health care provider is called upon –either because of personal conscience or because of external or physical circumstances – to make a decision, intervention, or judgment call. Often, the family subjects of the case are in conflict with the provider’s recommendation or they are not doing what they’re supposed to be doing. A family doesn’t show up for appointments, and hospital policy says they should be discharged. These are challenging problems with varied ethical dimensions that require thoughtful response. Within the paradigm of clinical training and development, this is a useful and instructive collection of materials for study. However, as the only editor who was a parent of a child with a neurodisability, I also saw the essays another way. It was an interesting view into how clinicians describe their work to themselves and to others. Here’s the pattern I saw: In the face of conflict, true to family-centred care principles, the provider would query the context of the family – what is it in their culture or understanding that makes them behave this way or make these decisions? What is creating the gap that has emerged between the provider and the family? And ultimately, how can they, the provider and institution, bridge that gap? In a variety of thoughtfully creative ways, utilizing what they know about the family’s background and social context, the provider tries to figure out ways to get everyone on the same page. For example, they might back off a little, give the family time to warm up to an idea. Or they might rally another family member to help their case. Or they may try to clear up misunderstandings by finding ways to further inform the family. Often, principles and frameworks from bioethics and PFCC are brought to bear on the case. And often, there are behind-the-scenes meetings where approaches are discussed and debated. Eventually the family is invited into the discussion. I interpret these scenes as the health care team joining forces not with the family or parent, but in order to deal with the family or parent. I remember attending our own care team meetings thinking it was the forum for us to figure out next steps together, only to discover that the others met separately first – perhaps to present a united front or to decide what options I could choose from. For some reason, it was not okay for me to hear whatever was being discussed or debated. I think the instinct throughout health care is to do the same thing as I saw in the cases and as I experienced myself: providers facing conflict confer with colleagues, query their own morals and commitments, invoke frameworks and tools for dialogue – all before presenting solutions to the family and inviting discussion. Although indeed the family may be at the centre of every deliberation, the family is only present and involved when invited. I can see that health care providers work very hard to understand the family’s perspective. But I can also see whose position is the dominant one, whose perspective is the de facto right or preferred one, who gets to define what the problem is, and most importantly, who holds the power to grant or remove decision-making opportunities. It can sometimes be hard to tell the difference between ‘working with the family to get on the same page’ and ‘identifying and breaking down resistance’. My critique of patient and family-centred care is not in its core principles. Dignity and respect, participation, collaboration, information-sharing. . . these are good goals. Important and laudable. My critique is of the use of these principles as instruments of persuasion, even coercion – corralled under this moniker of PFCC in order to be instrumentalized– where PFCC primarily serves the goals of the organization or broader health care system, or provides convenient cover for the provider to not have to think about larger systemic issues. From the family’s perspective, PFCC can feel like a frustrating marketing ploy, designed to calm down or manage the unruly customer. I’m not without sympathy for the health care system or the people who work within it. Institutions are faced with constant friction – people who disagree, people who question, people who react, demand or break down. To support providers in easing some of this friction, PFCC provides a helpful communication framework – a way to talk to and listen to patients and families. But it also creates a sanctioned platform on which families are analyzed and profiled according to their cultural or social contexts – by people who, like most people, are typically unaware of their own biases. Consider the unique aspects of the health care environment: the patient and family are often vulnerable and desperate, and the provider and institution are the gatekeepers and deliverers of treatment. In this inherent power imbalance, the family has all the risk and the most to lose. And the family that behaves outside predefined, preapproved tolerable limits has their entire social and cultural context laid bare for the social workers and clinicians and administration to pore over and analyze in order to figure out how to resolve a problem. The family gets no similar view into the workings of the health care system, the institution or the views of the provider. The family may be the focus but it’s still through a system-centric lens. In this collection of essays about PFCC, titled Paediatric Patient and Family-Centred Care: Ethical and Legal Issues and edited by Randi Zlotnik Shaul, Dr. Rani Srivistava writes an excellent chapter called “Culture, religion and family-centred care”. She explores how despite the intentions of PFCC, problems persist. So let’s ask the question: what about it. . . ? What is the culture of the healthcare provider, the organization and the system? I agree with the many scholars who say it is a culture of Western individualism, autonomy, self-governance, science, evidence and ultimately it’s about choices, and accountability for them. It is a culture where the presiding belief is that information leads to the right decision – and if you don’t agree with that decision then you probably don’t have enough information. It’s a culture where knowledge and the communication of that knowledge is assumed to be neutral and bias-free. Dr. Srivastava points out that, in this culture, clinicians have knowledge, and families have beliefs. To some, it may be debatable as to whether this is an avoidable condition – the power imbalance and adversarial nature is built in, this is the paradigm from which things run most efficiently. What I don’t think is debatable is whether this condition constitutes anything resembling a partnership between the family and the institution. Just because it’s called one, doesn’t mean it is. I believe the primary reason I was successful in the health care environment was because I learned to engage with it according to its own terms. My role as ‘expert parent’ was carefully constructed by me to ensure that I would be heard, understood and respected. I made efforts to appear calm and organized. I was rewarded with congratulations and appreciation – recognition of a job well done, with (I imagine) not a small sigh of relief that I continued to be an ‘easy’ parent to counsel. This invigorated me, and made me want to try even hard. I was also relieved, all the time, that I didn’t have the hair-raising fights with providers and institutions that I’d heard about from other parents. While I continued to be grateful for the pleasantness and helpfulness of our providers, I secretly congratulated myself for handling things so well and for being the ‘right’ kind of parent. So what’s the problem, right? Everyone got along, I made my own choices in the end, and the PFCC model was hard at work to make me feel comfortable. The first problem is that this performance I delivered as ‘expert but cooperative parent’ – which was by the way not pretend. . . it was a role I had so integrated into my identity it was hard to tell when I was ‘on’ or ‘off’ – this performance is highly desirable to health care providers. It is rewarded and praised. And the impression a parent has, whether real or not, is that their child is treated better as a result. We learn quickly that when relationships take a difficult turn, we – the family – loses. Some of us navigate this very well – I know others who don’t, and they end up ostracized, shut out, and deeply suspicious of the care they received. More serious problems occur below these performative layers. As my stories reveal, we were smoothly herded from one thing to the next. I was completely unaware of decisions made on our behalf or influences that nudged me in certain directions. I was invited to make decisions only at times that were deemed appropriate by the system. I had no visibility into what factors informed recommendations. This is by no means a unique experience. This should not sit well with us. I found a wonderful recorded conversation online, provided by the British Medical Journal, in their Patient Spotlight project. One of the voices caught my attention because our experiences are so similar. Like me, Cristin Lind is parent to a child with multiple special needs. We can look at this narrative and applaud this parent for her hard work and perseverance to carve out a reality that made sense to her and her family. And we should – caring for a child with chronic or severe disability or illness is really hard work. But. . . we should also notice how easily we assume that this kind of extreme advocacy is necessary. Why must a parent have to ‘arrive at a place of confidence’ in order to speak up? What meaning does PFCC have if families are drowning? Is it little more than a shoulder to cry on? While PFCC supports clinicians to engage in respectful dialogue, it does nothing to help families actually manage the tangled web of their lives – other than to get them to do it themselves. Many aspects of the tangled web are actually caused (or at least exacerbated) by the pressures and expectations of the health care system – a system which makes broad and far-reaching assumptions about the role and involvement of the mother, the developmental expectations of the child, and the extent to which the family ought to stretch itself before it breaks or begs for mercy. These are known and expected trajectories for families like mine. . . yet in all the conversations I’ve heard over the years about the importance of informed consent, no one has discussed these types of implicit expectations – the kinds of unspoken agreements Cristin mentioned. Until recently, I had assumed that responsibility for success in the health care realm – however you define it – rightfully belonged in the hands of the families. That it was up to us to make our experiences worthwhile. Success could be earned through educating ourselves, learning how to advocate, developing personal fortitude, learning to run the marathon instead of the sprint. This is not only what allowed me to be successful, but I assumed this is what is required of families in order to be successful. If only patients and families could be informed and empower themselves enough then all would be well. Right? Well, not quite. To be informed and empowered and to hold a seat at the table requires that the parent – typically the mother – has the skills, language, confidence, time and support to do so – all of which requires money and stability. Who do we suppose has the resources to engage in this way? Consider single parents. People living in poverty or with low socioeconomic status. People with disabilities, or mental health issues, or people who don’t speak English or people who don’t understand the health care system. If these families have any hope of effective advocacy for children they have to work twice as hard to be heard. These families have far fewer options in caring for their children – especially if they have complex and chronic needs – because most simply do not have the luxury of time or relief from caregiving to put on their business suits and empower themselves. 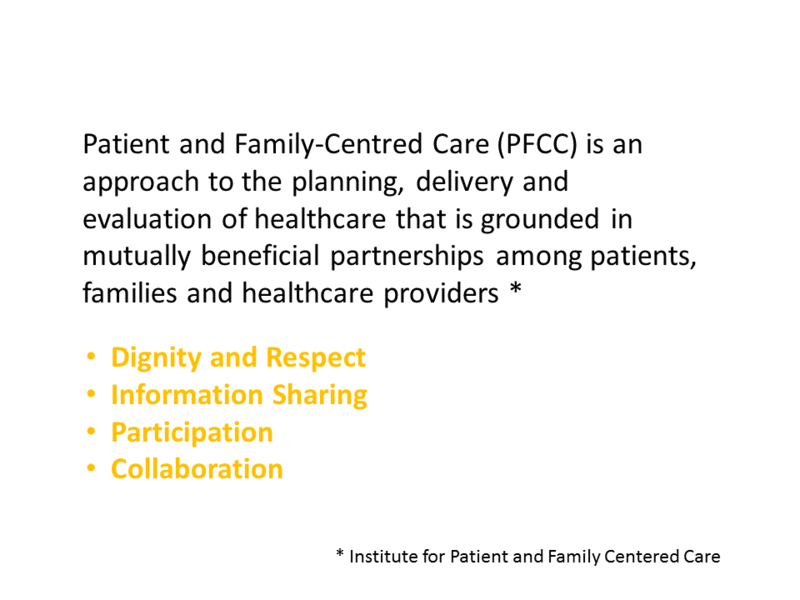 We could look at it another way of course – which is what the institutions would prefer: we could see PFCC as a helpful tool for the clinician, institution and health care system at large to better understand their patients and families in order to aid and improve service delivery. And there are opportunities for families to listen and respond. The clinician is trained to be respectful and sensitive, and to always consider the family’s social and cultural context. This sounds so good – it’s so hard to argue with this intention. To cast suspicion on PFCC seems weirdly ungrateful. The part that makes me most uncomfortable about all of this is just how difficult it is to pinpoint exactly what is wrong, who caused it, and how do we fix it. It’s so difficult because in the clinic, it seems people are getting along. But when we broaden our perspective, we start to see how hard families are working to perform appropriately once they walk through the clinic door. We see how health care providers collude and collaborate about the family, long before the family arrives on the scene. We see how the family’s performance is made necessary by the health care system. In fact, the health care system grooms families to behave this way. I suppose I shouldn’t be surprised this is how it goes. The system was designed this way. In order for health care institutions to keep ticking along efficiently, and to provide health care services to as many people as possible, responsibilities need to be externalized. Services and resources need to be rationed – often in the form of downloading work to family caregivers, who are an easily-exploitable free labour pool. To keep things moving, families need to be contained, managed and satisfied. The rigid boundaries of the past, between family and institution, no longer work. So room for resistance and negotiation is now built-in and anticipated – this is the work of patient and family centred care. And this is where ethics, and the principles under PFCC, become instrumentalized. This is the comfort zone in which I and all the other super-moms operate – we get to say our peace, pick between pre-approved options, and emerge feeling like winners. Someone close to me once asked, is it doing anyone any favours to point this out? To show that they’re not really in control? Maybe this little fiction is okay if everyone feels satisfied. Believe me, I’ve thought about it. My answer is no, this is not okay – especially considering what happens if you step outside the preset boundaries. This fiction only serves the ‘high-performing’ people well. For parents who complain too loudly, or are non-compliant, or who aren’t grateful and eager to please – tolerance is actually very low. I have friends who could recount stories much more harrowing than mine, but I do have a small final anecdote to share that I think amply illustrates this point. Owen had been scheduled for a small but important surgery a couple of times, only to have it cancelled last minute, each time, due to lack of recovery beds. Fair enough, I thought. This wasn’t an emergency, things happen. On the third occasion one of the nurses appeared frustrated on our behalf, and mentioned that they’d been overbooked for a while, and the doctor had failed to check before booking us. I thought – this time, this one and only time, I should call the patient advocate’s office, let them know that some scheduling improvements could be made. They were friendly on the phone, took some notes, and I felt I had done something right. About a week later, I got a call directly from the surgeon himself. He was not happy. He said “Ms. Johannesen, your complaint has them breathing down my neck. I did the best I could to fit you in, and sometimes other patients have to take priority. I’m sorry for your inconvenience. Can you please call off the dogs.” Then he muttered something about how no good deed goes unpunished. You know what I did? I apologized. I didn’t mean to get him in trouble. I was only looking to help the overall process. I was sorry he got blamed because that was not my intention. I called the patient advocate to say we had spoken and resolved the conflict. I never filed another suggestion again. During this talk, I have recounted all of the ways in which I was a model parent, operating from a place of privilege, enjoying all the good will PFCC allowed. And this was how a mild and inconsequential complaint played out for me. I was made to feel ungrateful, uncomfortable, I was confronted as the accuser, my privacy was violated. And I felt bad about it and apologized. Can you imagine how families like mine experience real conflict – I can, because I know many stories of poor treatment, bad decisions, terrible outcomes, near misses, wrongful deaths – and how traumatized some families are by not only the outcomes, but by the way they were treated. And truly I can’t say this emphatically enough: now imagine how families not like mine might experience those same conflicts. The providers, the institution and the whole system are very well served when families perform as they have been groomed to. Through a planned and systemically integrated process of consent and negotiation, the institution ensures parents continually self-adjust, self-manage and conform to what a good and compliant family should be – all the while, convincing us we are equal partners. But in reality, as Bill said earlier, you’re on your own. Very well written article and spot on. Thanks for your comment Claire – it’s a long one, I appreciate your time to read it! Wow! Thank you so much for sharing all this! Your experiences and work is making a huge difference in rehab! I was just wondering what you feel parents newly entering the healthcare system may take away from your story? Can this information/perspective on family-centred care be ‘taught’/discussed with families or can it only be learned through living/experience? How do you feel you may have reacted to the key messages of this presentation if the ‘past’ you heard it when you were just starting out in the health care/family-centred care system? I’m not sure it can be taught but it can certainly be shared… Families need to hear that there are different ways of seeing things. They may not agree, but at least they’re exposed to differing opinions and experiences. There are so many encounters I had where things just didn’t feel quite right but I had no idea how to name it, or even how to talk about it. And nevermind thinking others might feel the same way too! There were times I met families who were more experienced than me and I reacted differently to different people – sometimes I was inspired, sometimes I felt sad or angry, but mostly I thought, “well, that’s not how it will be for us.” It was frightening to see how families were coping (or not). But always, a seed was planted about one more possible way the future could look, and I think I did make choices based on that. So even though I didn’t necessarily absorb certain ‘messages’ at any particular time, some of the experiences stuck with me and influenced how I saw myself as our family grew older. I was probably less judgmental of myself because I knew others had felt similar ways. Thank you for commenting Karen – I wish it wasn’t so, but I’m glad that my observations align with someone’s on the ‘inside’…! Wow Jennifer. This was an amazing, well thought out and well written post. I’ve often spoken about how the healthcare system is made to function well (or at least better) for those families with the privilege to meet it on it’s own terms and how fundamentally inequitable that is. What your piece made me reflect on, is how much energy it takes for all of us to fit into this accommodating role we need to put on in order to keep things rolling smoothly. Until there really is a true partnership (and not hierarchy) between health care practitioners and patients/families, patients and family centred care won’t be achieved. Wow!!!!! What an incredible article. You express so beautifully and truthfully what I feel after my son transitioned from the NICU to the medical appointments and rehab. Your words made me cry and realize so much about our own journey with CP and other medical challenges. Thank you Jennifer! I keep coming back to this and finding more and more here. It’s just so wonderfully articulated. I am struggling with a crisis of imagination right now … trying to imagine how we can make things better. Anyway – will probably come back and read this 17 more times and keep finding more. Thank you! Thanks Kate! Yes, there’s a lot to process with this one – probably several themes that need teasing out. Hard to figure out where improvements can come from when there are so many moving parts. Such a well thought-out and brilliantly articulated critique of patient- and family-centred care. Thank you. I will come back to it, read your book and seek you out as we work to strengthen a culture of partnership in our hospital. Thank you Mireille – please do get in touch! Thank you for sharing. A beautifully written, thought provoking, reflective post.